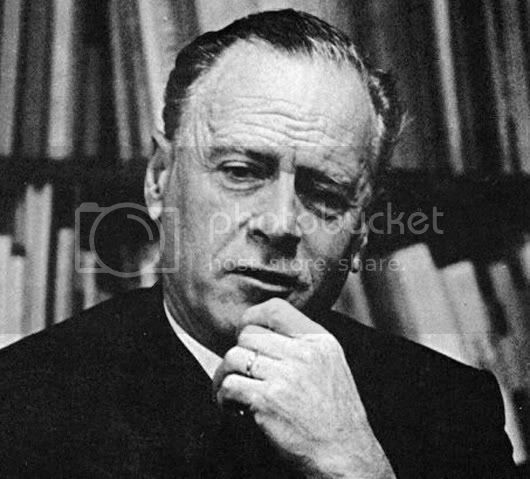 "that patternmind, that paradigmatic ear, receptoretentive as his of Dionysius"
I don't think I had ever heard the name Marshall McLuhan before last year. It was in January or February. I had heard of a Finnegans Wake group that meets each month up in Venice, California and decided to drive two hours up there one night to check it out. It was an extraordinarily enlightening evening, hearing the Wake read aloud and a whole array of minds discussing the various meanings and interpretations of James Joyce's abundantly rich masterpiece, but I was also introduced to the genius of Marshall McLuhan. Turns out, the group is actually a Finnegans Wake-slash-Marshall McLuhan reading group and we spent the first half hour discussing current events from the standpoint of McLuhan's Tetrad of Media Effects. I went to another one of their meetings, coincidentally, almost exactly a year later but I showed up late and missed the McLuhan part. It's been only recently that I've taken the time to familiarize myself with the life and work of this 20th century megamind named McLuhan (pronounced "Mick-Loo-In"). It's because he's actually been in the news a lot lately with a great new book about him by Douglas Coupland. McLuhan was a Canadian-born, Cambridge-educated scholar who could best be described as a media mystic or media metaphysician. A popular intellectual figure in the 1960s, he wrote a number of paradigmatic books on the rapid advancement of media technology---essentially, he philosophized (in an entertaining manner) on the way we perceive the world. It's amazing to read some of his theories and writings and realize that he explicitly predicted and discussed things like the explosion of the internet 40-50 years before it happened. 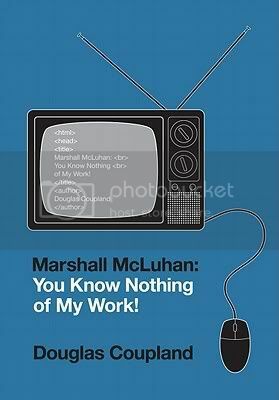 Here's an example, from the opening of Coupland's new book entitled Marshall McLuhan: You Know Nothing of My Work! The world of discontinuity came in most vividly with the telegraph and the newspaper. The stories in the newspaper are completely discontinuous because they are simultaneous. They're all under one dateline, but there's no story line to connect them. TV is like that. It's an X-ray, mosaic screen with the light charging through the screen at the viewer. Joyce called it, "the charge of the light barricade." In fact, FW is the greatest guide to the media ever devised on this planet, and is a tremendous study of the action of all media upon the human psyche and sensorium. It's difficult to read, but it's worth it. -MM. You should also check out this EXTREMELY informative interview which explains McLuhan's interpretation of the ten thunderclaps (each a one-hundred-letter word) heard throughout Finnegans Wake. The Wake was McLuhan's vade mecum. In later years he kept one copy unbound, with each page pasted onto a sleeve of 3-ring paper. The stack stood in an accessible spot just outside the door of his office. McLuhan was forever plucking fresh pages like a gambler toying with oversized cards. He liked to snap the pages into new configurations, up, down, across, and read the phrases in a kaleidoscopic collage, much as Joyce himself had written them. Bruno, who flits through dozens of the pages, must have become a pleasantly familiar ghost. The new McLuhan book by Coupland is a great read, the language very straightforward and concise, the content interesting and entertaining. The story of McLuhan's upbringing and education is a very unique one and Coupland presents it all knowledgeably and with a wit and quirk reminiscent of McLuhan himself. The book has gotten great press lately including an interview with Coupland in the prestigious Paris Review and a New York Times Book Review cover story. Finally, here is a great YouTube clip I found of an interview with McLuhan. He was an expert (though enigmatic) debater and talker as you'll see. Interviewer asks: Have you ever taken LSD? McLuhan: No. I've thought about it. And I've talked with many people who have taken it. And I have read Finnegans Wake aloud at a time when takers of LSD said "That is JUST LIKE LSD." So I begun to feel that LSD may just be the lazy man's form of Finnegans Wake. I had this strange hope by the end of the evening that by the time I finish Finnegans Wake, I will lose the illusion that I am in a small room and discover I am in a much larger, perhaps even a boundless one.